This 3 in 1 Electric Shaver is Multifunctional, not only be used as a beard razor, a nose hair trimmer, but also a hair clipper at the same time. Rechargeable design and can also be powered by a AA battery, enjoy flexibility and convenience with the ability to shave cordless. High performance, built to last, and easy to use. 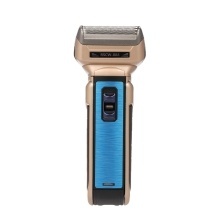 3 in 1, not only be used as a beard razor, a nose hair trimmer, but also a hair clipper at the same time. Stainless steel blades, which designed for a comfortable and efficient shave on the curve of the face. Fully washable, suitable for wet/dry shaving and easy cleaning. Rechargeable design and can also be powered by a AA battery, enjoy flexibility and convenience with the ability to shave cordless.